Flashpacker is a new buzzword for student travelers and young at heart backpackers, and one defining characteristic of the breed is gadget hauling. We lug laptops onto chicken buses, haul tattered backpacks bulging with travel tech gadgets into hoity hotels or sketchy hostels, pack cargo pants pockets with world cell phones, and we find the wifi. Yeah. So, the first step for packing a flashpacker backpack with travel gadgets is finding the right gadget-friendly laptop backpack. We can’t find a perfect specimen, but we get pretty close with this one. Having just been in Australia, we noticed how the Aussies love the phrase “purpose built” – one Australian company gives meaning to those words with laptop backpacks built by Bondi Beach hangers who needed a camo laptop backpack of their own that was protective, comfy, stylish enough, and very sturdy. Enter STM laptop luggage, purpose built for your flashpacker travel. Why do we love STM’s Loop laptop backpacks? They’re ergonomic, air conditioned, well padded, well made, water resistant, and they’ve got laptop compartments, sound ports and practical pockets aplenty without featuring excess crapola. A waist strap turns these backpacks into workhorses, but can be completely removed. Small Loop has pockets galore and three zippered sections; laptops up to 13" including MacBook Pro. Apparently, STM has stopped making this backpack (drag!) -- try eBay or MacMall. If your back can take it, this pack can haul it – holds most 17” monsters. Got a recommendation for a travel backpack? Add it here! Let's fill this backpack with some fave flashpacker gadgets. Next: best flashpacker laptops 2008, including the lightest ultraportable and smallest PC. Personally, I can't be separated from my itty bitty (but old) iBook when I'm traveling (taken a serious licking and kept on ticking). Apple not to your tooth? Scroll on down for some PC travel laptop lists. While you're researching, read a great thread over at Engadget -- hundreds o' responses to a traveler's question regarding which laptop to lug around the world. Where to tap the wires with your laptop? Locate a hotspot with a mini WiFi finder next. Travelers will find a keychain sized wifi finder a boon; use it instead of booting up to locate a wifi hotspot. Imagine lugging an open laptop around a foreign city, watching a stumbler program while you stroll and looking for a place to get online. Not. Now, imagine clicking a button on the mini wifi hotspot locator in your pocket and finding a wifi connection just-like-that. Snag a comfy seat and pull out the laptop. Very cool must-have item for a flashpacker. Almost a laptop backpack accessory, really -- you'll probably carry it in a cargo pants pocket. About those cargo pants we mentioned? Look at the best traveling world cell phones next. Also called "Qtek 9100" and "HTC Wizard," the iMate KJAM Mini is a tech wizard's dream cell phone. Overseas use only for now, though. The E-Ten Glofish 700 literally rocks with an FM tuner... and GPS gizmo in a phone? Oh, man. What's a SIM card and where can I buy one? Where can I buy prepaid SIM cards for overseas use? And the Wyoming cell phone company we love so? It's called Union Wireless, and we will be loyal forever... if it works for you, grab an unlocked GSM phone from them. You've got a world phone -- now let's find some pockets to put it in, as in gadget travel clothing. When packing a laptop backpack with travel tech gadgets, don't forget to toss in some gadget-carrying tech travel clothing -- take a tip from the Boy Scouts and be prepared with plenty o' pockets for every gadget. Sun Valley's SCOTTEVEST knows you can't leave your gadgets at home, and they've designed "technology enabled clothing" that makes it easy to bring 'em all along. Their TEC line features the cool MP3 player-friendly "Ultimate Hoodie" -- a decent sweatshirt that loves your iPod as much as you do -- and the SeV "Ultimate Cargo Pants" with gadget-grabbing pockets galore. Many years ago in a galaxy far, far away, I rode a Whistler chair with a tech weenie who had the most ingenious little thing -- a portable cassette player with earphones. It was called a Walkman. We've evolved - now we've got clothing made just to carry around the grandbaby of the Walkman: iPod-packing duds like SeV's Ultimate Hoodie. Anybody can make cargo pants, right? How about cargo pants with zip off legs? Okay -- common enough. 18 pockets? Well.. A Personal Area Network built in? That would be new. SeV's cool cargo pants have an astonishing array of gadgety features for the travel techie: leave home without leaving it all behind. What to pack next? Well, an international electricity adaptor is a must for plugging in gadgets worldwide. The All-in-One Adapter with surge protector is the best international adapter I have ever seen, hands down. At $20, it is a screaming deal. Adapters do not convert electricity, but this electrical adaptor takes the guesswork out of plugs on phone or laptop chargers internationally (don't need to convert electricity for those). Flip out the right prongs (countries are labeled beside plugs), plug those prongs into the wall and your cord into the adaptor, and you're set. Works in reverse, too (like plugging a UK unit into an American outlet). Writing? Can a pen be high tech? You bet... check out a night writing pen next. Who has time to journal when traveling? You, that's who -- if you have a Magellan's Night Writer pen and a cool travel journal. Write at night -- a hostel bed is a good place to jot down the day's travel memories and with a pen that lights your travel journal's pages, you won't disturb dorm mates. Slip a journal into your laptop backpack's front pocket and a Night Writer Pen into one of the pen sleeves -- write now. Built-in blue LED light illuminates page with a click. 5-1/2" L x 3/4" W; 1 oz. Low tech rules in the travel journal world -- online journals are fine, but sites go down or close... and a real journal can live in your mementoes box forever. Try a world-famous Moleskine journal -- it's a joy to use and when you get home, you'll be glad you journaled. The advent of the ebook reader is a cool boon to the backpacker and the Amazon Kindle 3G, with free wifi, has ushered in a new era for student travelers: the truly workable lightening of the book load without breaking the bank (that would be the iPad's job). The Kindle 3G is a light, thin piece of hardware with which a traveler can not only read book (including textbooks*), magazines and newspapers, but hook up to the internet with worldwide wifi. It's not one gadget to rule them all, since it's not a GSM phone nor a true traveling internet solution, but it's a very versatile tool for travelers at $189.The 3G is the third generation of the Amazon Kindle, or the Kindle 3, which is called the Kindle 3G. Spend a little less but forego the free 3G -- which is well worth getting -- and get a wifi only Kindle at $139. Why do you want the 3G? 3G is a term regarding cellular or mobile networks: just like a cell phone with 3G, the 3G Kindle accesses mobile airwaves from just about anywhere. In many countries, you can use a web broswer via a 3G network, meaning your Kindle's internet interface essentially looks like a "normal" web page. Facebook, tweet, Google, access Amazon's treasure trove of reading material. *A problem for serious studiers: page numbers aren't consistently preserved in a printed book's transition to a Kindle, making it hard to cite sources in a footnoted paper or do precisely assigned readings. World travelers say, "Don't drink the water," for a good reason -- millions of squirmy, scummy reasons, in fact. Don't be scared; do be practical, don't drink straight from the tap in developing countries unless you know the water's okay, don't eat fly-festooned food and dp consider using one of your backpack's elasticized side pockets for a water bottle purifier and strain your own drinking water to avoid gut-wrenching encounters with the developing world's water. Cartridge system inside the water bottle strains gunk and eliminates bacteria in tap, river or lake water. Quite a concept -- a filtering drinking straw that can keep many open water bugs at bay. Doesn't kill Giardia (hate that stuff), but Medgadget says it works (and features a photo of a fellow sipping straight from a third world river). 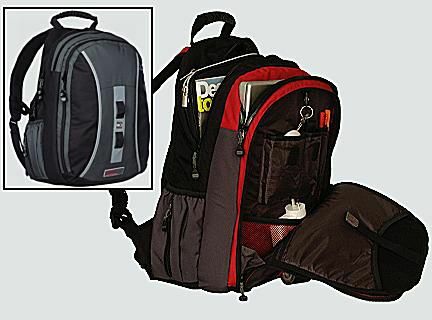 Lastly, let's lock up all these travel tech gadgets and get a tip for keeping your laptop backpack safe, too. The last travel must-have for your laptop backpack is a set of luggage locks to keep its contents safe -- you're carrying some spendy tech gear. The TSA (Transportation Security Administration) allows baggage screeners to clip luggage locks, sift through stuff and send a bag on unlocked. Let's not have that. And whether checking a bag or not, you need to lock it. The torch logo on these Safe Skies TSA luggage locks tells TSA baggage screeners that they can open bags, using TSA-supplied keys, and relock without clipping the luggage lock. And the company will replace a lock if it does get cut. Four-dial heavy duty combo locks come in five cool colors to help with luggage ID -- beauty brass key versions, too. I've tried these locks; I like 'em. I carry three TSA locks and, if I check luggage, use two to lock my backpack (main compartment and zip off day pack), and keep one in my carry on shoulder bag -- if my locks are clipped at an airport, I thus have a spare. The two locks lock my backpack's zippers in my lodging or one locks it in a hostel locker, and I lock my shoulder bag's zippers with the third while I'm walking around. Luggage locks are a way to avoid avoiding lost luggage while hanging about in airports, too. And that's it -- your locked laptop backpack is packed with the best tech travel gadgets. Happy trails!